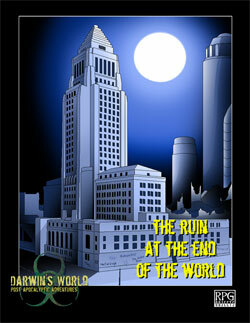 The Ruin At The End Of The World presents one of the most iconic locations of the Twisted Earth setting, the ruined city of Los Angeles. Better known as the "Necropolis", this sprawling ruin carpets an entire basin, for miles in every direction, nestled against the furthest edge of the known world. Stories of this legendary place are common among the nomadic people of the desert; it is said to be a desolate place, where nothing lives, and only the ashes of millions of Ancients - incinerated in the Fall - fill the streets. The Ruin At The End Of The World essentially expands upon the Necropolis setting as briefly touched upon in the Darwin's World 2nd Edition rulebook. This setting has a long history with Darwin's World, first as a play-by-email game run in the year 2000, and later serving as the "city of the dead" in the Darwin's World 2nd Edition rules, providing a sample of what the great cities of the world have turned into since the Fall. This book strives to bring together the in-game history of Los Angeles with the setting overview presented in Darwin's World 2nd Edition, to create a detailed location which existing parties can visit and explore, or in which to begin entirely new campaigns as survivors struggling to survive in perhaps the Twisted Earth's most legendary place: the Necropolis.